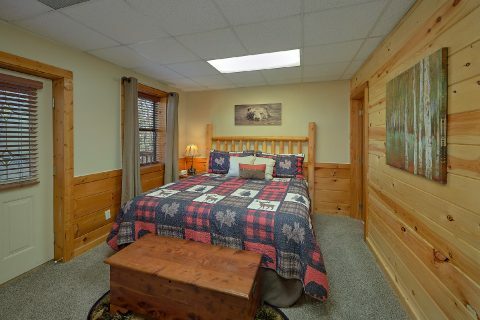 In the beautiful landscaped Arrowhead Resort of Pigeon Forge, you'll find "Angels Ridge." 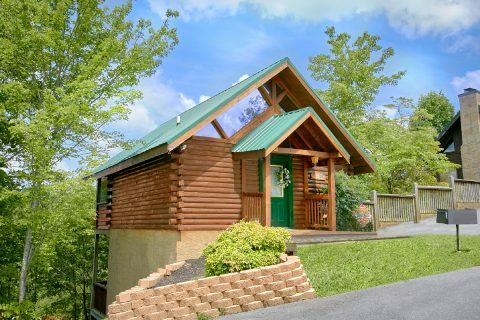 This romantic 1 bedroom log cabin has everything couples need for an unforgettable stay in the Smoky Mountains. 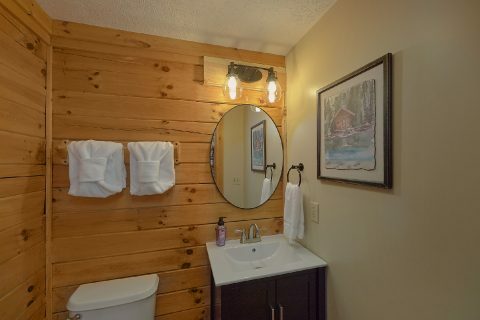 From your cabin's convenient location only minutes from Downtown Pigeon Forge to its resort pool access to relaxing amenities, this rental retreat is perfect for couples. Your 1 bedroom cabin sleeps 2 guests comfortably and makes an excellent launching pad for a honeymoon, anniversary trip, or couple's getaway in Pigeon Forge, TN! 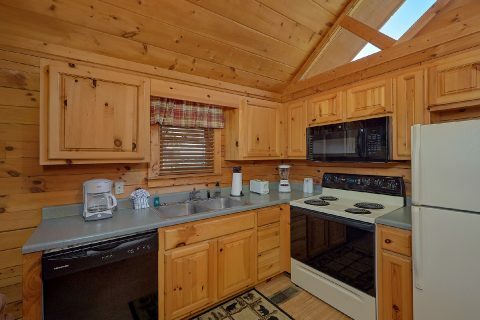 Start your first day in the Smoky Mountains with a delicious breakfast made in your cabin's kitchen complete with appliances and cookware. 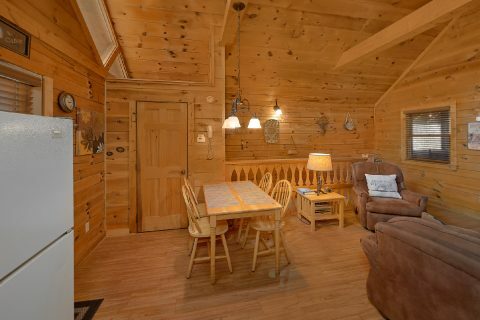 Enjoy your meal in the cozy dining area or step outside onto your rental's covered deck for a cup of coffee in the fresh mountain air. What will you do on your first day in Pigeon Forge, TN? 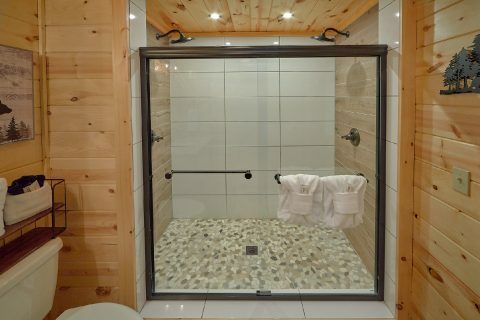 The possibilities are nearly endless for you and your sweetheart! You can enjoy a laid-back day by the poolside at Arrowhead Resort's outdoor pool. Action and adventure wait at Dollywood Theme Park with thrill rides and water slides galore. You and your special someone could also experience great savings at Tanger Outlets or the Island in Pigeon Forge. Downtown Pigeon Forge hosts tons of attractions, restaurants, and shops that can provide days of entertainment. For an outdoor adventure, couples can also drive to Gatlinburg and the Great Smoky Mountains National Park. Guided horseback trips or a zip line tour are other romantic options to enjoy. Or simply drive the beautiful roadways of the Smoky Mountains and see a gorgeous sunset from an overlook in the national park. 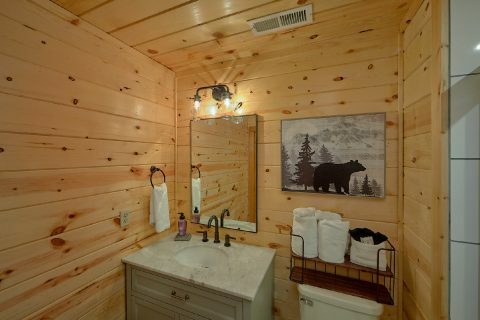 When you return to your romantic cabin in Arrowhead resort, you'll find the perfect space to relax and kick-back. 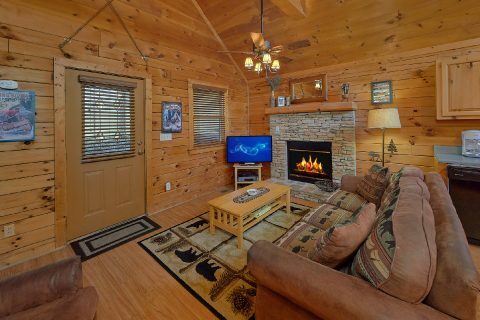 The main level of your rental features the living area complete with a television, comfortable furnishings, and a cozy, stacked stone, electric fireplace with a handsome wooden mantel. 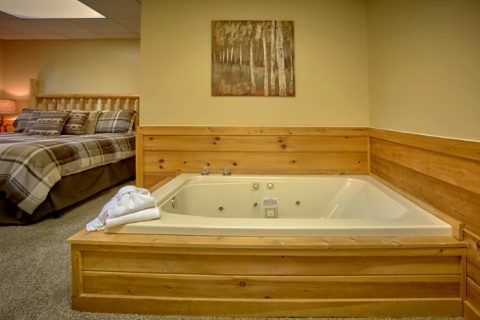 To unwind, take a dip in the bubbling waters of your cabin's year-round hot tub or enjoy the privacy of your in-room jacuzzi tub. 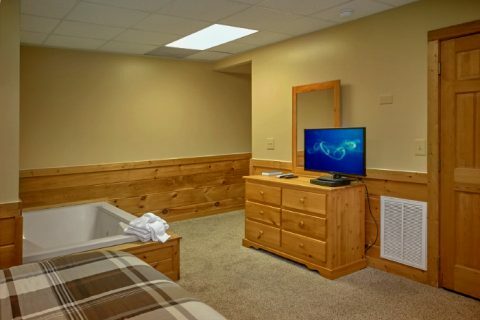 On the lower level, you can retire for a restful night's sleep in your cabin's king-sized bedroom with a television and private bathroom. 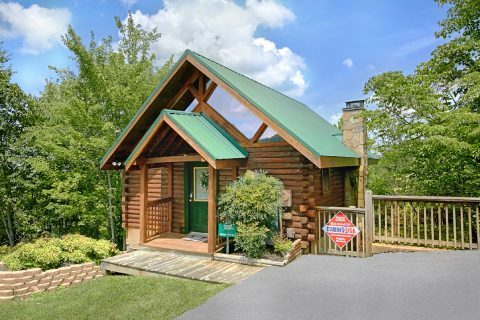 Whether you're sitting in rocking chairs in the fresh Smoky Mountain air or grilling some franks on your cabin's charcoal grill, you'll be glad you rented a beautiful cabin in Pigeon Forge as a treat for you and the one you love. 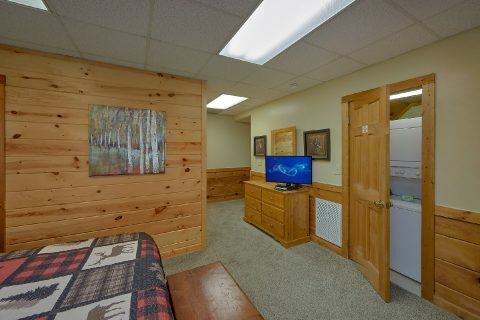 "Angels Ridge" also comes with other conveniences like WiFi Internet access and a washer & dryer. 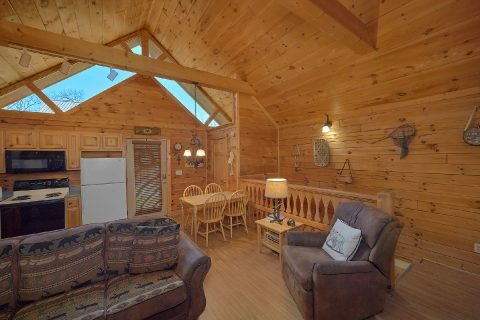 Book your romantic 1 bedroom cabin for two with Cabins USA and save with our online cabin discount! 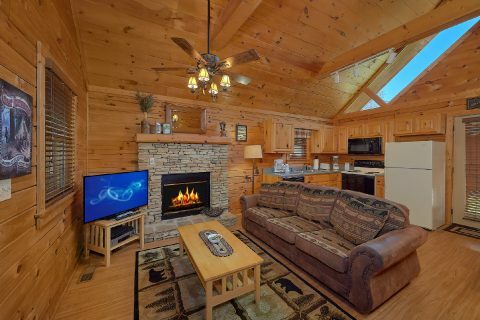 Book "Angels Ridge" in Arrowhead Resort in Pigeon Forge and save on your honeymoon or couple's retreat!